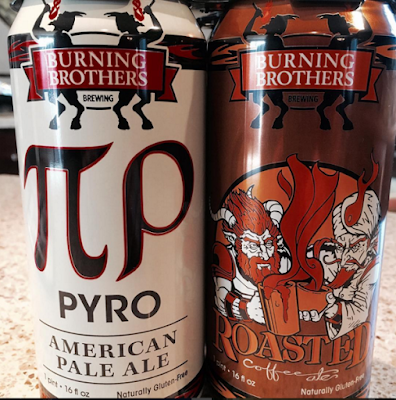 The founders of Minnesota-based Burning Brothers Brewing, Dane Breimhorst and Thom Fos, have set out to brew great beer that just happens to be gluten free. After the two friends set out to start a brewery, Dane was diagnosed with Celiac Disease. Instead of giving up their dream, they decided to create a dedicated brewery where they could create gluten-free beer to share with the world. Pyro, an American Pale Ale (4.6% ABV), comes in a 16-ounce can strikingly labeled with a bold "ΠΡ," the Greek letters phonetically spelling out the name of the beer. A pint-glass pour reveals a golden color with a foamy white head and a pleasant semi-sweet hop aroma. It tastes slightly bitter, with an agreeable citrusy flavor reminiscent of lemon or orange peel. Light to moderate in mouth feel, Pyro is a delicious, crisp APA that masks the sorghum well. This versatile beer can be enjoyed with a variety of foods but works especially well with grilled meats and smoky cheese. I opted to use a tulip glass to try Burning Brothers' Roasted Coffee Ale (7.7% ABV), a strong, dark ale blended with cold-brewed coffee. Cracking open the can ignites the aroma of freshly roasted coffee beans along with a light sweetness. Unsurprisingly, this reddish-brown ale has toasty coffee flavors that finish dry, hiding the sorghum flavor. This unique variety is an excellent beer that pushes the boundaries of gluten-free brewing - a real pleasure to drink! Pair this one with your favorite gluten free dessert, perhaps one with dark fruits. I appreciate that the brewers minimize the "gluten free" designation on their cans, as that tells me that they want to be compared alongside their traditional peers. I'm extremely impressed with Burning Brothers and can't wait to try more offerings from them. Currently, Burning Brothers beers can be found in Minnesota (including at the taproom in St. Paul), Nebraska, North Dakota, South Dakota and Wisconsin, but the brewers are working on expanding distribution and Pennsylvania is one of the target markets.